Chartered Accountant is a prestigious course to opt for but due to the amount of time and dedication it demands, students are often scared of pursuing it. Compared to other professional courses, CA also takes almost the same time, provided a person clears all the exams in the first attempt itself. If you are thinking about becoming a Chartered Accountant after 12th then this post provides all sort of information that you are required to know to have a clear road ahead. Institute of Chartered Accountants of India or ICAI is the professional accounting body of India which regulates this profession. It is not just the regulating authority but also the licensing body for CAs in India. You have to be a Commerce graduate or post graduate or any other graduate or post graduate with a minimum percentage of 55 or 60 respectively. You have cleared intermediate level exam of ICWAI or ICSI. Just after passing 10th exams, register with ICAI and enroll for CPT i.e. Common Proficiency Test. This exam is conducted after taking 12th standard exams. CPT is conducted twice every year i.e. in the month of June and December. There are 4 subjects at this stage. The course is similar to what you study in 10th and 12th. Integrated Professional Competence Course is the next target to achieve. To be able to register for IPCC, passing in 12th exam and CPT is a must. Registration for the same has to be done 9 months prior to the date of examination. There are 7 subjects at this stage. The course is very vast and it is a difficult stage to clear. There are two groups of subjects. Group 1 has 4 subjects and Group 2 has 3 papers. It is a stage of 700 marks and you are required to score at least 40 marks in each of the subject individually, summing to 50% or above in aggregation. Scoring more than 60 marks in any of the subject comes as a bonus to you as you get an exemption in case you fail in any of the subjects, you are not required to repeat that subject in your next attempt. After successfully clearing all the 7 subjects, you can now proceed with Articleship training. To start with the training, the candidate should clear at least Group1 of IPCE along with completing 100 hours of ITT. The duration of this training is 3 years. The training goes on simultaneously with the Final CA exams. The training requires you to work under a CA of your choice for 3 years. It is a practical exposure to the industry and offers you with great opportunities to learn more about your profession. The candidate is also entitled for stipend during this training. This is the final stage for becoming a Chartered Accountant. A candidate is eligible for writing a CA final examination if he or she has completed at least 2.5 years of articleship training. Also the candidate has cleared both groups of IPCE. There are two groups, each with 4 subjects. The candidate has to have minimum 40% in each subject and aggregate 50% to clear CA final. 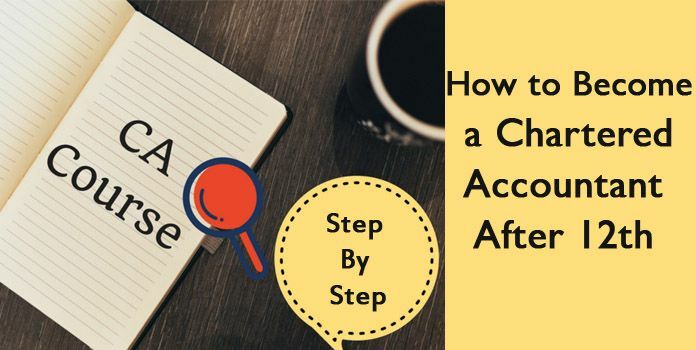 If you wish to pursue CA after completing 12th standard then you must keep in mind these steps which will be the stepping stone towards becoming a Chartered Accountant in India.